The first drive-in movie was shown in the driveway of Richard Hollingshead’s Camden, New Jersey home. Hollingshead sat in his car while his 16 millimeter projector displayed a movie on a screen he projected. He took this concept and expanded it with the idea of allowing hundreds of people to watch a movie from the privacy of their own automobiles. On June 7, 1933, Hollingshead opened the world’s first drive-in movie theater in Camden. Within the fan shaped, tiered parking lot and inclined ramps, more than 400 cars in eight rows came to watch a movie on a 30 x 40 foot screen. The theater was an immediate success and Hollingshead and his cousin created a drive-in movie theater franchise throughout the United States. In one twelve year period, the number of drive-in theaters increased from 100 to 2,200 locations. It appeared that people were excited about being able to go out without having to dress up. At the same time, however, they didn’t mind getting out of their cars to get food, wash their cars, play shuffleboard and miniature golf or many of the other activities that theater owners devised for them. 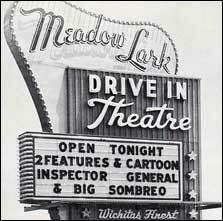 Drive-in theaters did have some problems early on, including obstructed views and poor audio. These were remedied by tiering and spacing the grounds and placing individual speakers on each car. The success of drive-in theaters gradually tailed off in the 1970’s because of rising real estate costs and competition from cable television and video cassette rentals. For 35 years, however, they provided a family-oriented recreation opportunity that remains special for many people.